Houses burning down. Parents dying. Guardians dying. Untalented actors with ropes, knives, and nefarious plots. Hurricanes, deadly leeches, dangerous reptiles. Lumber mills with numerous safety violations. This is a series of unfortunate events, and you can pull up a chair and watch. Or you could just look away. 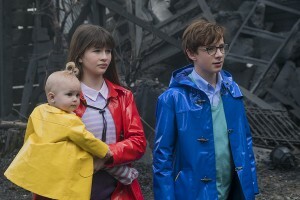 This January Netflix premiered Lemony Snicket’s A Series of Unfortunate Events, an adaptation of the children’s series of the same name. To date, eight episodes have been aired, adapting four of the thirteen books. Like the books before it, the show revolves around the adventures, misadventures, and misfortunes of the three Baudelaire children. After their parents die in a mysterious fire, they must escape Count Olaf’s schemes to get a hold of them and the Baudelaire fortune – again, and again, and again. I had heard of Lemony Snicket before, invoked as an example of the literary devices of lampshading and of breaking the fourth wall. Knowing only this, and absolutely nothing of the actual story, I tuned into A Series of Unfortunate Events. The two most prominent elements of this series are its tone and its humor. The tone is ostentatiously bleak, with the theme song warning that watching will ruin “your evening, your home life, and your day,” and narrator Lemony Snicket promising endless woe, troubles, and inconvenience. A literal pall hangs over the show – much of it, especially the scenery, appears to have been put through a gray filter. And this grayness is a mistake, an overreach of cleverness that undercuts the specific pleasure of a visual medium. The series’ showily dismal tone is part and parcel with its humor – sometimes dark, always absurdist. A Series of Unfortunate Events thrives on repetition (it’s not a sea, it’s a large lake); on smashing the fourth wall (Lemony Snicket explains the concept of dramatic irony in relation to a particularly unfortunate event); on the unnecessary definition of words (in this context, “unnecessary” means “not needed”); on repetition (it’s not a sea, it’s a large lake); on absurdity (your closest living relative is the relative who lives closest to you); on repetition (LARGE LAKE). As a rule, humor should not be explained or defended. If you don’t like this sort of humor, you won’t like the show. Even if you do, the show sometimes goes too far. It’s funny that Lemony Snicket has a two hundred-page book written by the woman he loves, explaining why she can’t marry him, but the repeated jokes about an older woman’s unfulfilled desires for marriage and a family are merely sad. The characters of A Series of Unfortunate Events, like its humor, lean toward the absurd. Even Count Olaf, the villain of the story, is ridiculous, though he is sinister, too. The Baudelaires themselves are loyal to each other, courageous when the moment demands it, and – considering what they have to put up with – remarkably polite. They can be stilted at times, but in the natural sort of way you might expect wealthy prodigies to be stilted, and there’s something charming about them. The last episode suggests that the series may be breaking out of this cycle. I worry, however, that it will be crippled by a more fundamental flaw. You see, A Series of Unfortunate Events lacks heart. Sometimes it lapses into genuine drama, with ensuing moments of pathos, and there is poignancy in how fast the siblings hold on to each other. But all this seems almost beside the point – and in truth, if the show took Olaf and his schemes any more seriously than it does, it would be too dark. A disconnect exists in this series, and there’s no heart strong enough to unite it in meaning and emotion. Despite this lack, A Series of Unfortunate Events has its virtues. It can be visually interesting, in spite of the overabundance of grey. It is sometimes fun, often delightfully absurd, and on rare occasions, moving. The cleverness and the humor are abundant, and who knows? We are only eight episodes in; the best may yet be ahead.